Todays' Card is for the "Backgrounds" Challenge running through to the 30th of April. Here is my card and then the process - along with a few tips! I used Distress Oxides on watercolor paper - I have no idea what I am doing with them yet, this just happened to work out. I did use my stamping tool, the rubber is deeply etched, and since this is going on watercolor paper, I felt like I might need more than one inking. 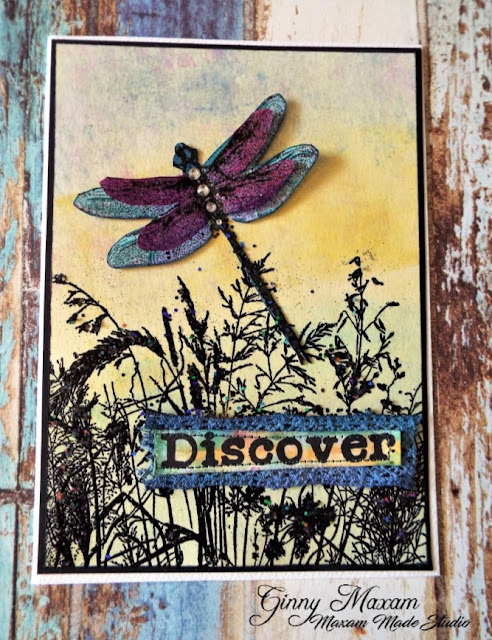 Next, I stamped my dragonfly, and here is a tip, when you are fussy cutting, cut into the black stamped area and then re-edge with a black marker. I coasted the wings and body of the Dragonfly with nail polish, it gives it a super glossy clear coat and super fine glitter glimmer. sprinkle of glitter in the 'Shrubs' Look how nice these weeds look! enter the challenge, you might win a very cool prize! This is lovely, Ginny. Fabulous coloring of the dragonfly. I love this card. so beautiful. Thanks for sharing.